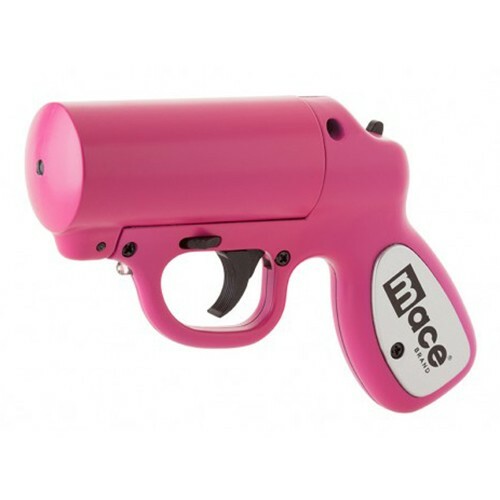 This Hot Pink Pepper Gun model is the most accurate non-lethal self defense pepper spray available. Ideal for distance defense with the convenience and accuracy of a point-and-shoot handgun design, its advanced delivery system allows you to spray attackers with a power stream of OC pepper from up to 20 feet away and from any angle. The Pepper Gun model features a trigger activated LED light that helps aim at your target in the dark and is easy to reload with pre-filled replacement cartridges. Each gun includes (1) Water Practice cartridge (1) OC Pepper Spray cartridge and battery for LED light operation. You can safely DEFEND YOURSELF in a threatening situation with the effective power of Mace Maximum Strength Formula… 10% OC Pepper. Just spray and get away! Mace Pepper Sprays are formulated to be a safe, effective, and less-than-lethal means of self defense. Effects: Mace Pepper Spray is a formulation of Oleoresin Capsicum (OC) a natural ingredient derived from hot peppers. Upon direct facial contact, OC Pepper causes eyes to slam shut, coughing, and an intense burning sensation to the skin with extreme discomfort of vision and the respiratory system. Effects should lessen in approximately 45 minutes. Use: For maximum effect and range, it is recommended to prepare Pepper Spray for immediate use with a few rapid shakes prior to taking aim and discharging at your attacker. Deploy Pepper Spray by using thumb or forefinger to depress trigger in short 2 to 3 second bursts, Pepper Spray can be quickly dispensed if trigger is continuously depressed. Safety: Strong irritant, keep out of reach of children. Read instructions and first-aid directions included with your Pepper Spray prior to use. If accidentally exposed to Pepper Spray, remove contaminated contact lenses and clothing immediately, flush effected areas with plenty of cool water and expose to fresh air as soon as possible. Spray canisters are under pressure, do not puncture or incinerate. Expiration: Mace Pepper Spray has an approximate shelf-life of 4 years, each unit is labeled with an expiration date. Expired units may have reduced effectiveness and loss of range or fail to function, and should be disposed of in accordance with local environmental regulations. Approx. 6.5" x 4.5" x 1.5"